Some wee Scottish people have all gathered together in one nice set to hold your grocery list on your fridge! Of course, no one NEEDS them, but they are just too much fun to pass by. Sold in a complete set only! 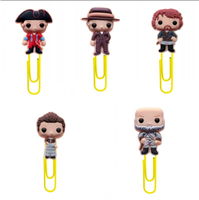 While strangely reminescent of some characters many love, we will just say these wee Scottish people have all gathered together in one nice set to organise the papers on your desk! Sold in a complete set only ! Monthly magazine in stock now...November 2018..
Back issues through September still available. Check out November, and put month into customer comments. 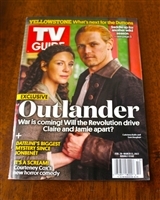 The Outlander 12 month "mini" wall calendar is a slightly smaller version of the 2019 wall calendar. A convenient brief case or purse size of 7"x7". 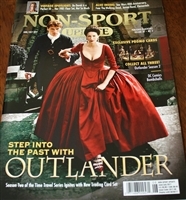 Choice of two covers... "JAMIE" or "JAMIE & CLAIRE"..the insides are the same. NOTE: CARDS NOT INCLUDED, plastic sleeve is opened. Follow the path of Claire and Jamie with this wonderful guide of the locations featured in Diana Gabaldon’s Outlander novels. In Outlander's Scotland by Phoebe Taplin see where the telly show filmed from many of the cobbled streets to the palace and garden of Culross, which became fictional Cranesmuir with images of the cast as well.Learn all about the iconic 1960s Pathfoot Building at the University of Stirling. Just reading of them is entertaining, however if actually traveling to Scotland this also serves as an itinerary which focuses on easy day trips from the characterful cities of Edinburgh and Glasgow, with the Royal Mile, Arthur’s Seat and Holyroodhouse Palace to name a few. This guide, packed with Outlander locations,has it all and will tell you about the most rewarding sights, when to visit them and how to get there. The Outlander 12 month "mini" wall calendar is a slightly smaller version of the 2020 wall calendar. PRE-ORDER. This item ships in July 2020. The second run of Cryptozoic's exclusive Outlander Trading cards but no need to guess or collect ! Mint condition original box contains the complete base set of series 2 cards and as well their foil wrappers. Please note they docontain the 3 chase sets BUT NOT parallels or specialty cards. Just a base & chase set. Still at this price, a wonderful way to start playing the game. MARCH SPECIAL...order for St. Patrick's Day and get a free Irish rubber duck and some sweeties. for this week's return of Starz Outlander. The 16 month, 6"x5" desktop version is packed with images and quotes for a daily dose of your favourite series! AMC's Walking Dead stars are all here on this beautiful 12"x12" (16) month wall calendar loaded with wonderful dramatic and delightfully gory images for every fan.